Wagons west! 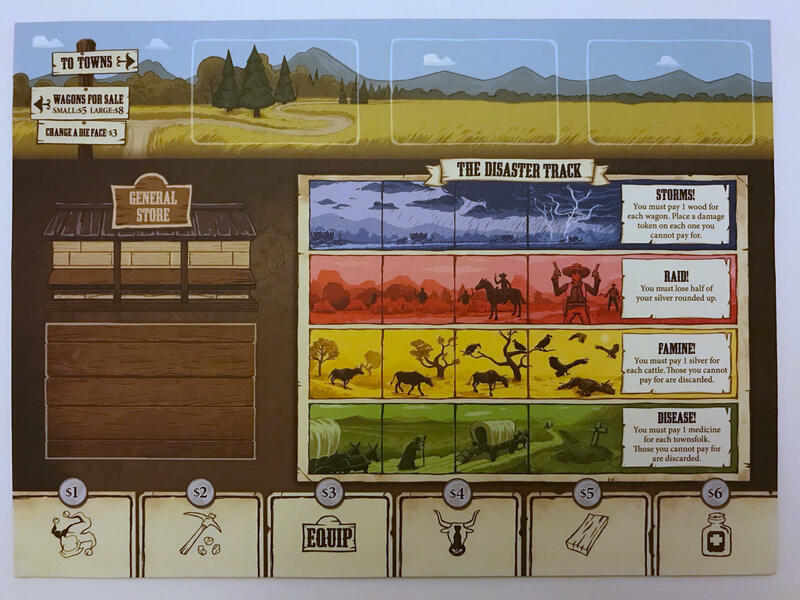 In Pioneer Days by Tasty Minstrel Games you will lead a wagon train for 4 weeks. The goal is to attain the most victory points by collecting cattle, equipment, townsfolk, and, of course, gold. With limited space on your wagon you must pack wisely while you save silver to buy additional wagons. And prepare yourself for disasters. Storms, raids, famine, and disease. They are inevitable. While this is not a cooperative game you may find yourself conspiring with your opponents from time to time to avoid a mutually destructive calamity. The game comes with lots and lots of components. In fact, if you include all the cards, dice, tokens, chits, and so on there are over 250 total! To list all of them would be exhaustive and unhelpful to this review. I’ll only discuss the dice, the main board, the player board, and the components that give you victory points in detail. The others I’ll only mention in passing. Rest assured, all of the components are of the top quality that I have come to expect from Tasty Minstrel Games. There are total of 25 dice in the game. There are 5 of each of the following colors: red, yellow, green, blue, and black. Each die has 6 faces: Wild, Mine, Equip, Cattle, Wood, and Medicine. The main board is what drives most of the game’s action. It has a spot for town cards which you can use to curry favor with the towns at the end of each week. Favors are converted to VPs at the end of the game. There is a spot for handy equipment that you can acquire and store in your wagon. Equipment is useful in protecting you against disasters or giving you a boost with mining gold or when gaining silver or other resources. STORMS! You pay 1 wood for each wagon you own or place a damage token on the wagon if you cannot pay (damage tokens cost you -2 VPs at the end of the game). FAMINE! You pay 1 silver for each cattle you own or discard any of them you cannot afford. DISEASE! You pay 1 medicine for each townsfolk or discard any that you cannot spare medicine for. And, finally, there is a track along the bottom that represents each face of the dice which I’ll discuss later. Each player starts with a player board. This board gives you an identity and it gives you an ability and your starting resources. Also, it conveniently has the Equipment List so you can have a reminder as to what each of the 12 different equipment tiles do. The Standard Pioneer side of the board is the same for all boards. But flip the board over for a slightly more advanced game and then each player has a unique ability and different starting resources. Cattle: you gain 1 VP per cattle you own at the end of each week, including the end of the game. Favors: you gain 2 VPs for each favor token you have at the end of the game. The tokens that represent 5 Favors are worth 10 VPs. Gold: you gain 1 VP per gold nugget on all of your Gold tokens at the end of the game. Your tokens could have 1, 2, or 3 nuggets on them. Damage: you lose 2 VPs per Damage token that you have on your wagon(s) at the end of the game. To setup the game, give each player two player boards and let them choose one to keep, return the others to the box. Or just let everyone choose their favorites if you want. The rules don’t say this but…I won’t tell. Shuffle all 22 Town Cards together and keep the top 9. Place them at the top of the main board and flip 2 of them face up. The Townsfolk cards are marked with letters which creates decks A, B, C, D, and E. Keep only two decks and shuffle them together. Place 6 cards face up under the track at the bottom of the Main Board. Give everyone the appropriate starting resources and your wagons are ready! Pioneer Days is played over 4 weeks. Each week has 5 days. You will take a turn on each day of the week. That means that you will get 20 turns in Pioneer Days. No more, no less. Regardless of player count. To begin the game, add a set of dice (one of each color) per player plus one set to the black dice bag (i.e. 4 sets, 20 total dice, for a 3-player game). The starting playing takes the horseshoe token and the dice bag and draws out a number of dice equal to the number of players plus one (i.e. 4 dice in a 3-player game). Once that player rolls these dice, day 1 of the first week has begun and you do not reroll these dice. In turn order, decide which of the dice you want to take and resolve its ability. You have a few choices here. Mine: Draw 1 gold token from the gold bag and add it face down to an empty space in your wagon. Equip: Take any 1 of the Equipment tiles from the General Store and add it to an empty space in your wagon. Cattle: Take 1 cattle and add it to your herd. Wood: Take 1 wood and place it in your wagon. Medicine: Take 1 medicine and place it in your wagon. Wild: Use this as any other face of your choosing. Another option for the dice. If you don’t like the dice that are remaining when it’s your turn you can pay 3 silver and turn it to any face of your choosing and do any of the 3 actions already discussed. Aside from the lost silver, the main drawback to this option is that any equipment you have that usually allows an action based on the die face you’ve chosen is not triggered. Play continues this way until there is one die remaining. Match that die’s color with the Disaster Track and advance the appropriate token (match the color) one space. If the remaining die is black, then advance all of the disasters one space. This is the end of the first day. 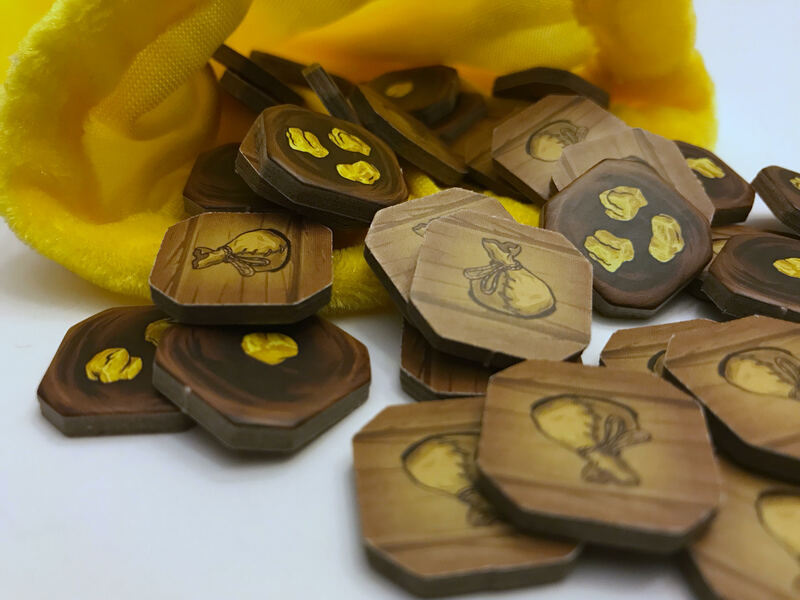 Pass the dice bag and player token to the next player and repeat until all of the dice are gone from the bag. This is the end of the first week. If you have a disaster, resolve the action and move the tracking token back to the start of the track. In the event that more than one disaster is triggered at the same time resolve them in order from top to bottom. Upon reaching a town each player first resolves any card effects that allow scoring (or other ability) at the end of the week. Then move your score token 1 VP for each cattle you own, if any. Then you may satisfy any face up town cards you are able to. Each player can only satisfy a card once but a card can be satisfied by any number of players. Once this is done, discard the remaining Townsfolk and the Town cards. Put 6 new card Townsfolk out and 2 new Town cards (unless it is week 4 where you will have 3 Town cards available). When you have completed the 4th week first go through the usual End of a Week procedures. But then everyone calculates their final scores by scoring all gold nuggets, favors, any VPs gained by recruited Townsfolk, and lose VPs for any damage tokens. The player with the most VPs is winner and gets to demand that everyone present refer to her as “Master Pioneer”. At least that’s how it goes at my house! 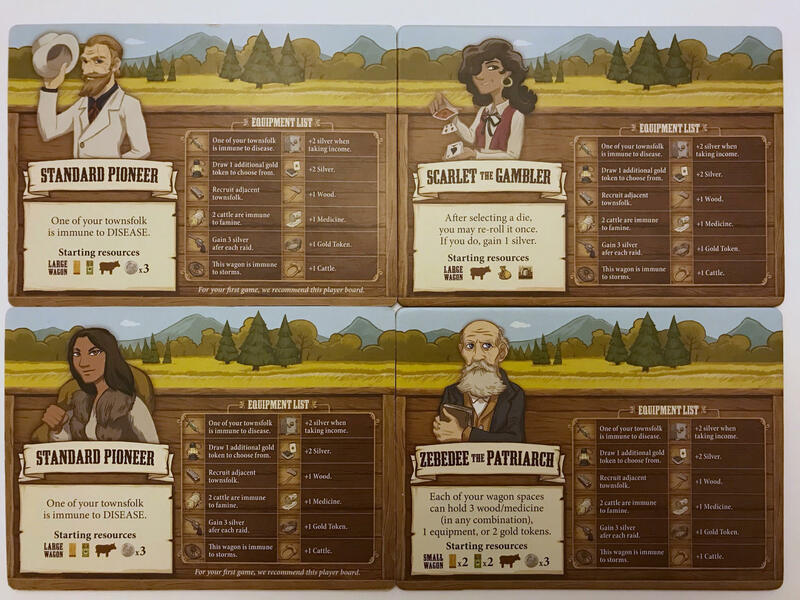 I played Pioneer Days by Tasty Minstrel Games with my kids and my wife and our feelings on the game are generally favorable. Some of us like the game more than others but no one disliked the game at all. At times, it felt like a cooperative game but I chalk that up to your individual strategy. There is nothing that says the players should all work together to prevent disasters. In fact, there were times when I purposely chose a yellow die so the red one that was left would trigger a Raid! My wife was stacked with silver and I was tired of her buying up more wagons. So I taxed her a bit, handicapping her ability to buy wagons during the next day. Dice rolling is listed as a mechanic on Board Game Geek and I guess there’s enough of that for it to be listed. But because you roll at the start of each day the luck element that usually comes with dice rolling is minimized. Personally, I don’t mind a decent amount of luck in my games but it wouldn’t have been great to have more of it in this game. Despite the lengthy explanation of how the days work, they actually play fairly quickly. Where we ran into speed bumps was more along the lines of our children not thinking of their potential moves until it was their turn. “Hmmm…what…do…I…want…to…do?” But I think that comes with the territory actually. They’ve come a long way so it wasn’t a terrible inconvenience. My wife prefers shorter games and this one is listed as 45-75 minutes on the box. We were closer to 75 minutes than 45 but, again, that was due to childhood indecision. However, the players stayed engaged the whole time and watched each other’s moves carefully. Whether they used that to their advantage to anticipate their opponent’s future moves is another story. But the potential for a lot of engagement and interaction is definitely there. Trigger disasters if it hurts an opponent more than yourself. Take a die/Townsfolk/piece of equipment you suspect an opponent may be after. Loved them! Is that good enough? No? Okay. All the cardboard chits are thick and sturdy. 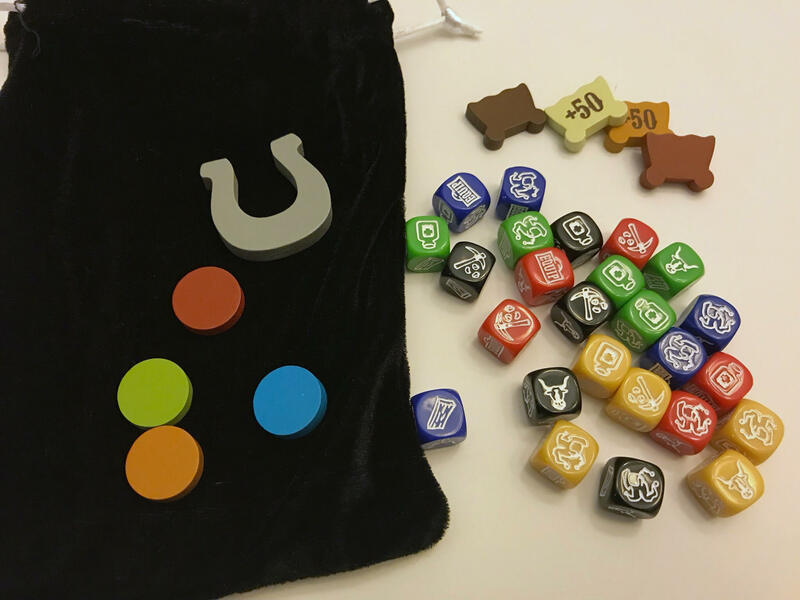 The cattle meeples, wagon scoring tokens, dice, and boards are great! The cards (Townsfolk and Town, alike) may be smaller than you’d like at first glance but they grew on me. Any bigger and it would make recruiting more and more Townsfolk a pain to manage. I love Tasty Minstrel Games’ attention to detail where it concerns quality in their components. They nailed it! This one might be a mixed bag. My kids want to play it again and to play it soon. My wife will be okay waiting. Personally, I’m somewhere in the middle but leaning towards my kids’ side. One of my sons likes to recruit as many Townsfolk as he can for his strategy. The tricky part for the rest of us is remembering all of the special abilities those cards give him. This strategy tends to mean he’s lagging behind in VPs until the game is over where he suddenly starts racking them up. And that’s one thing my wife found disenchanting about the game: it’s so easy to score points! We finished our games within just a few points of each other which is great because no one really ran off with the game at any point. But the VPs did kind of rain down on us all at the end which was cool the first time. But kind of lost its appeal in subsequent plays. When, not if, I play it again I hope we can flip the Player Boards to take advantage of unique abilities and starting resources and really tailor our strategies to match our Pioneers. 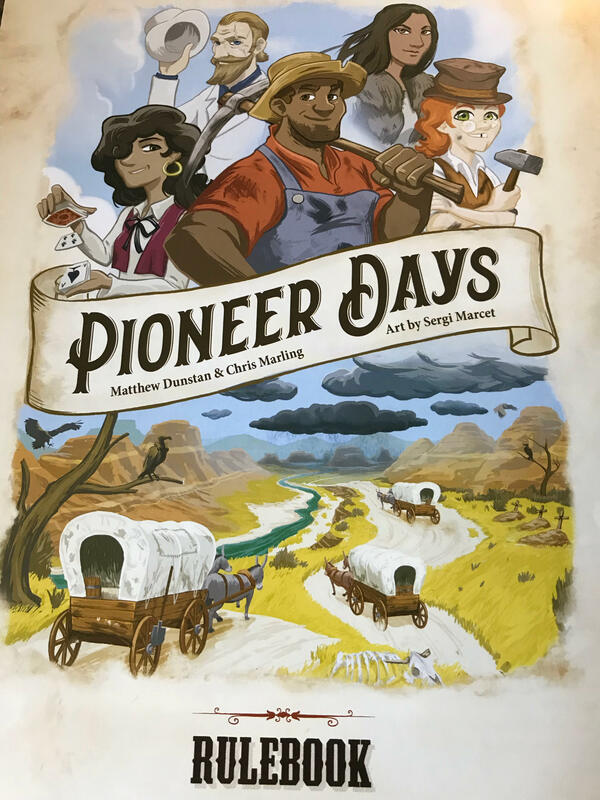 All in all, Pioneer Days by Tasty Minstrel Games is a solid game of medium-light to medium complexity (my 11-year olds caught on fairly quickly) that is engaging, great-looking, and fun to play. didn’t come with enough bags to organize the components (insert is thin cardboard)…it’s just screaming for a Broken Token organizer! 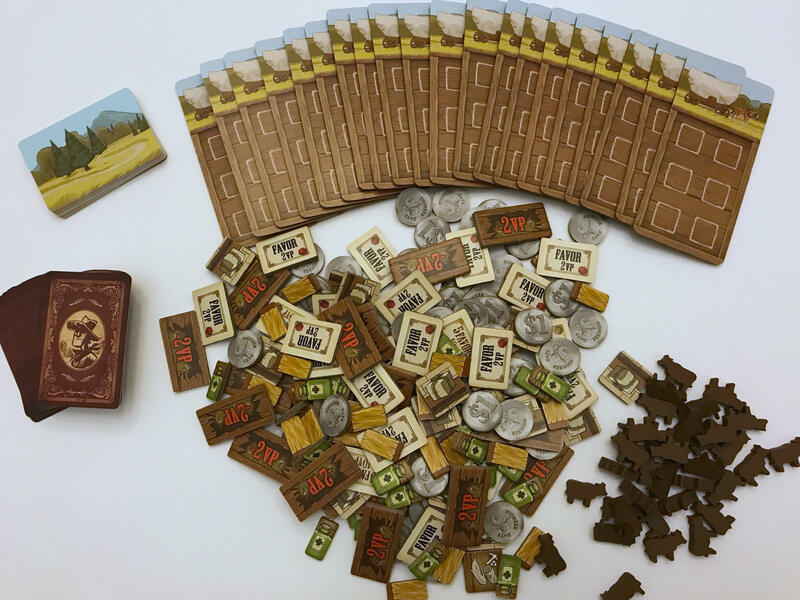 Have you played Pioneer Days by Tasty Minstrel Games? Or do you have another TMG favorite? Let us know!